Porphyry paving with Smolleri or “Slabs on Edge” is traditionally used for paving surfaces on steep slopes as they present the maximum roughness and the natural split surface is used as a decking for grip. Smolleri are ideal for the paving of roundabouts and other high stress traffic situations. Smolleri can add textural variation to contemporary paving schemes and can also be used for vertical cladding of walls (both inside and outside). The sides have a natural surface variation in widths (in plan) of between 60mm to 130mm. Depths range from 30-70mm. Lengths can be random or cut to size. “In the 20’s and 30’s coarse tiles or “smolleri” began to be used to pave sloping surfaces in many mountain villages in Trentino, Italy.and also in Lombardy and in Veneto. 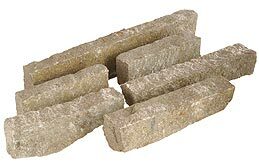 They are little slabs of porphyry, in the past they were very thin, now of variable thickness between 3 and 8 cm, variable length and up to 12 cm in depth, worked with split visible face and head and “planted” sideways or head first, usually in parallel lines. In the 60s the cement of Bergamo was paved mostly with “smolleri” of fixed dimensions and laid with herring-bone design, and still today it is unchanged both in its function of paving surface and in its aesthetic value. However, paving or surfacing of “smolleri” remains a rather rustic product. The “smolleri” for paving are generally laid in builders sand with grain size from 0 to 4 mm; sometimes the sand is dry mixed with cement in quantity of 200 kg per cubic metre. The dimensions of paving made of “smolleri”, plus its bedding layer is about 18-20 cm from the height of the foundation to the finished height. Having decided the laying planes, the inclination (at least 4%) and determined fixed points of reference, the bedding sand is laid to the most appropriate height. The poser starts the real laying, with a rapid selection of elements by sight, in order that their thickness is such that, brought close together near the “head”, they can be laid in regular and potentially parallel lines. In addition to steep slopes and walls, smolleri can be used for rumble strips and traffic calming areas that are not subject to snowplows.